Jefferson Memorial Forest used to be known as “Jefferson County’s Best Kept Secret,” but not anymore. With the help of Forest Fest, an annual bluegrass festival that promotes local businesses and artists, the Forest is gaining attention as the most treasured natural playground in Louisville’s backyard. Forest Fest began 13 years ago, when Tonya Swan, the program manager at the time, decided to try something new to bring Jefferson Memorial Forest into the public eye. The beautiful 6,600 acres of sloping, tree-covered hills right in the middle of Fairdale needed an event to draw in visitors who might not normally come to the forest. “I wanted it to be something that introduced the rest of Louisville to this great Forest and this very traditional community that held onto its small-town feel right in the middle of the largest city in Kentucky” Swan said, explaining her motivation for starting the event. Despite Kentucky’s rich Bluegrass roots, Swan felt that Louisville had failed to showcase the genre and the talented artists from the area. It would take a lot of effort, but she believed Forest Fest would be an excellent opportunity to bring Bluegrass fans out to the forest and put both the music and the location on the map. The first Forest Fest was in 2005, and there were just two bands, 100 people, an oversized stage, and one speaker. In recent years, however, Bluegrass has made a comeback in Louisville due to regular jams, the work of Bluegrass Anonymous, and local bands becoming more popular in the area. By 2008, Forest Fest’s headliners were Dr. Ralph Stanley and the Clinch Mountain Boys, and the event attracted over 5,000 attendees. The event is growing every year with six musical acts and more local food and drink vendors and family activities. The event could not happen without all of the amazing volunteers, forest and parks staff, and sponsors such as Metro Council, LG&E, and WFPK. Berk Bryant, the “Country Gentleman’ from WFPK Radio, has been a familiar site throughout the history of Forest Fest. Forest Fest includes both traditional and progressive/Americana bluegrass. The Forest has recently added music and band workshops as well as an expanded camping area for the festival. Rebecca Minnick, current Program Manager at the Forest, took over the festival in 2013. She starts planning the next year’s festival when summer camps end and works tirelessly to gather all the required resources needed to hold such a huge event in the middle of a forest. An outdoor event always comes with hiccups and difficulties. But even on a rainy day like they had for Forest Fest 2016, people were dancing in the rain and having a blast. The goal of Forest Fest is to promote Jefferson Memorial Forest and raise awareness of all the infinite opportunities for free, fun learning right in your backyard. Jefferson Memorial Forest is a place for Louisvillians to hike and picnic under the leafy canopy and a chorus of songbirds. A place to go fishing with your children. A place to discover all the wildflowers of spring. A place to camp under more stars than you can count. A place for your children to look back on and remember those magical days of summer camp where they got to catch bugs, go canoeing, and build forts in the woods. And lastly, a place to enjoy a beautiful spring day surrounded by the best Bluegrass and Americana music in Louisville! This year’s Forest Fest is happening May 20th from 10:30am to 7:00pm. Admission is free. Parking is $10 per vehicle. Studio 2000 Deadline Extended to March 24! Studio 2000 is a partnership between Louisville Metro Parks and Louisville Visual Art that allows high school students who are interested in pursuing visual art as a career to have the opportunity to work with professional artists in one of four focus areas— clay, fiber, mixed media or the first-ever mural art track! Students are not only provided with high-quality instruction throughout the course, but they also receive a $500 stipend at the end of the eight-week program. Studio 2000 will be offered this summer from June 12 through August 3, 2017 on Mondays, Tuesdays, Wednesdays and Thursdays from 3:00 pm until 6:00 pm at Shawnee Arts & Cultural Center, 607 South 37th Street. In 2001, the City of Louisville’s Office of Youth Development created Studio 2000 to connect teens with a passion for art with professional artists. The initiative was modeled after a similar program in Chicago. At its peak Studio 2000 had over 100 students participating each summer, but in 2008 due to budget cuts during the recession the program went dormant, but we are thrilled that it has been revitalized through a new partnership with Louisville Visual Art. Since its resurrection in 2015, Studio 2000 has seen 40 talented young artists ignite their passions, develop their skills and bring their artwork into the public eye. Working under the guidance of dynamic teaching artists, Studio 2000 apprentice artists create functional and marketable artwork from tableware to jewelry to clothing. The teaching artists work with the students to explore new and unusual techniques, while placing a strong emphasis on craftsmanship, resulting in unique, high-quality artwork. Past participants in the program have experienced tremendous growth in their skills and confidence throughout the course of the summer. With field trips to galleries and museums, visits by local guest artists and supportive critiques, this unique program invites students to experience life as a working studio artist while spending the summer with other passionate and creative young people. We are so thrilled to welcome another group of exceptional students to the Studio 2000 program this summer! Our teaching artists have innovative projects planned that will stretch and expand our students’ skills and creativity in a way that a traditional classroom rarely does. The program will come together for a public exhibition and sale at the end of the summer that brings proceeds back to Studio 2000 to support future programming. Students who are interested in participating in Studio 2000 may apply on LVA’s website– the application deadline has been extended until March 24. Students who progress to the next round will be invited for a portfolio review and interview in late March and accepted students will be notified in early April. 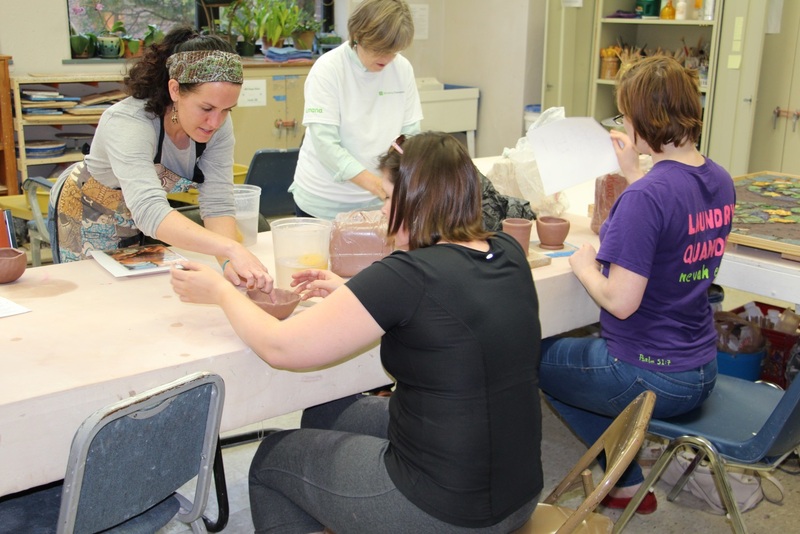 Meet Rebekah Frost Flint – a Pottery Artisan at Beechmont Community Center in South Louisville. 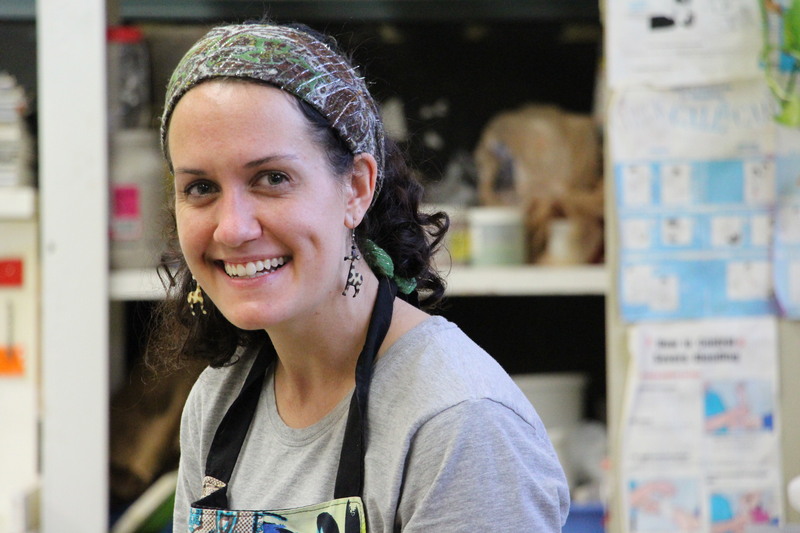 Rebekah joined the staff of Beechmont Community Center in May, and began teaching pottery classes in September. Rebekah was born in Nairobi, Kenya, to parents working in a Ugandan mission doing theological education and healthcare. Her first experience with clay was a Rift Valley Academy, an international boarding school in Kenya where she enrolled in three pottery classes. Rebekah attended Union University in Jackson, TN, where she obtained a B.A. degree in Art (emphasis in ceramics). She also received a minor in Education and completed her K-12 teacher licensure in 2010. After graduating, Rebekah taught several art & pottery classes at her high school in Kenya for two years (2010-2012) before moving to Louisville. Rebekah has been making pottery at Beechmont for a year. She currently teaches a class on Monday mornings and Thursday evenings. The class is $50 for an 8-week course. “It is a gift to be able to engage in creating! Teaching people how to work with clay is also very fulfilling in that I have the joy of facilitating others’ discovery and delight,” she said. Searching for that perfect holiday gift or stocking stuffer this season? 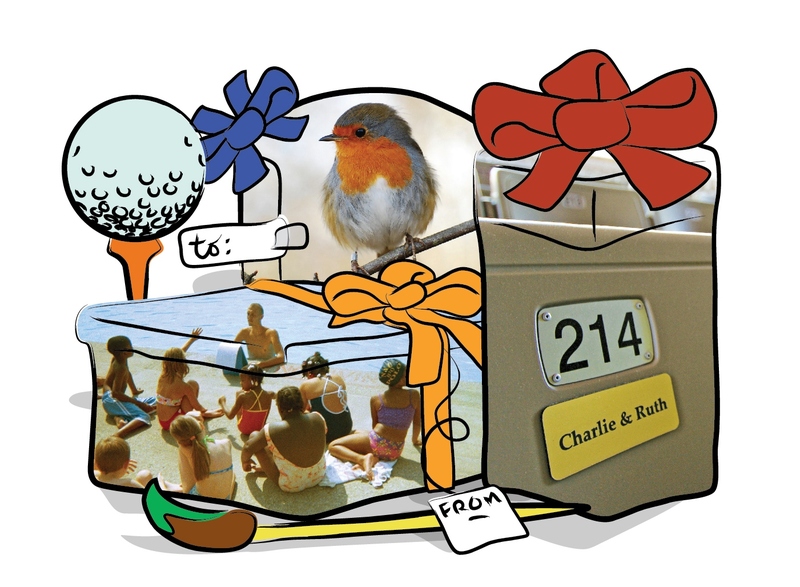 Louisville Metro Parks and Recreation has something for everyone on your list! The Welcome Center at Jefferson Memorial Forest carries wildlife guides, nature-themed jewelry, sweatshirts and caps. Gift cards are available for purchase too! Gift certificates for art classes may be purchased in any amount, and used for a variety of lessons for adults and children. Painting, pottery, screenprinting, silversmithing, guitar and flute (and much more) are offered at our two arts centers. A gift card to the Mary T. Meagher Aquatic Center can be applied toward memberships, swimming lessons and more. Not only do historic homes Locust Grove and Riverside, the Farnsley-Moreman Landing have traditional holiday programs to attend, they also carry unique and sure-to-please gifts in their gift shops. Why not make a donation in a loved one’s name? Any amount helps, and Metro Parks has several options to choose from: adopting mature trees or planting new ones, memorializing a park bench with a plaque, personalizing a brick at Riverside, the Farnsley-Moreman Landing, and naming seats at the Iroquois Amphitheater, which come with a certificate, plaque or engraving. For more information on any of these items, visit metro-parks.org or call 502/456-8100. There are numerous photos and videos floating around the web taken by JOLS visitors (we love that by the way! ), but nothing can quite capture the experience as actually being there. 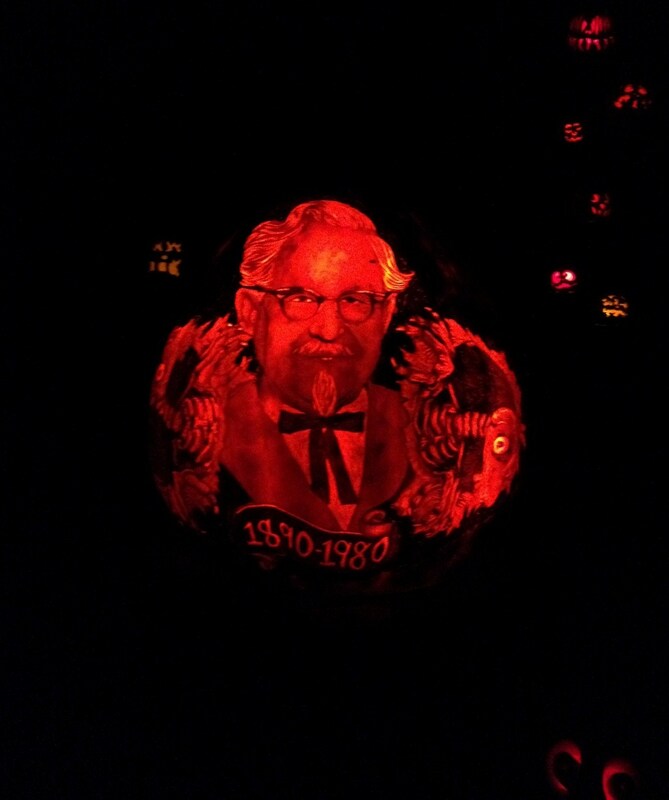 There are just a few weeks left to come out and enjoy a truly unique fall event! 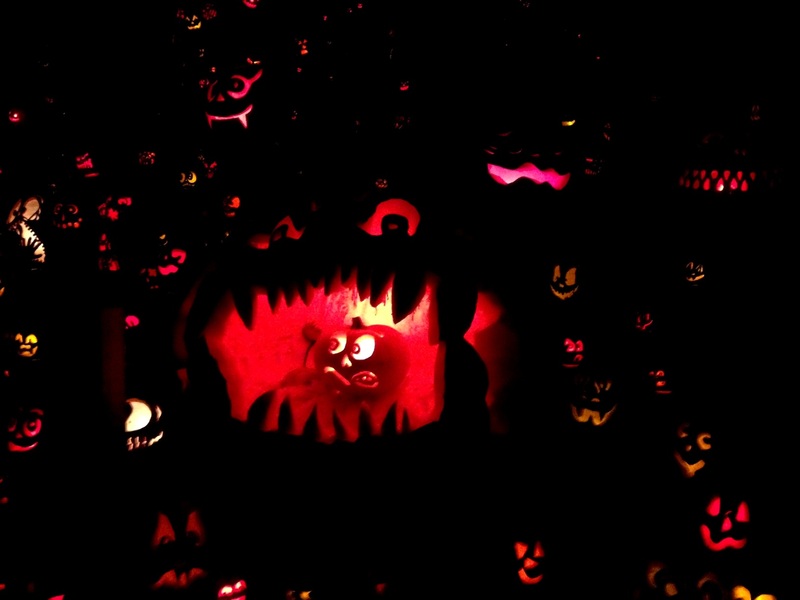 Jack O’ Lantern Spectacular ends November 2nd. Discount: Monday – Wednesday, tickets are $10 after 10 p.m. Learn more. The Iroquois Amphitheater ended its 75th Anniversary season with a BANG! Wonderful performances by the University of Louisville Big Band Jazz Ensemble and Justin Paul Lewis. Attendees celebrated with a cocktail hour, tour of the facility and dancing onstage. 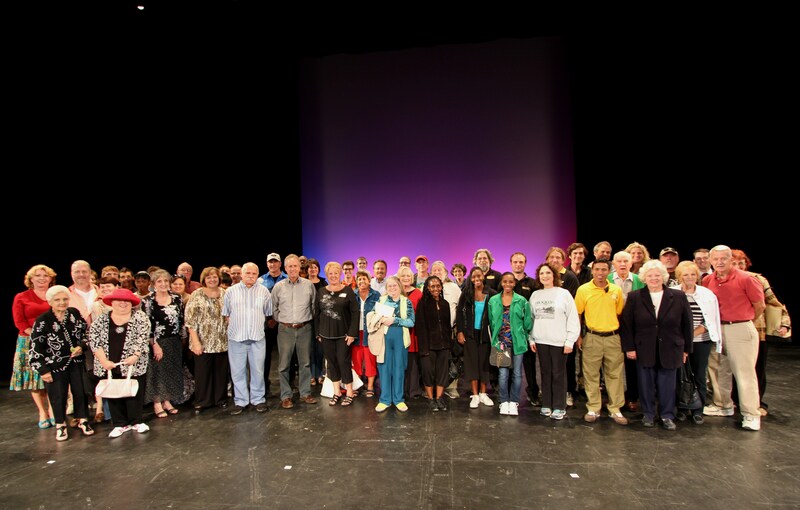 In a special moment to commemorate this anniversary; past and present performers, musicians, crew members, ushers, and patrons were invited to join us for a photograph on stage. If you were unable to attend the 75th Anniversary event, we also unveiled a short film (25 min.) depicting the history of the Amphitheater and its impact on the community. Check it out!